To help you to find "your marks" in this new discipline, yet increasingly common among professional congueros, I propose schemes of congas sets of some of the greatest virtuosos of today. The playing itself does not offer more technical gestures than with two congas. 4: Playing a basic pattern on 1 or 2 congas with one hand (example: clave), and another with the other hand (eg: tumbao) on two other congas (playing with the hands in "independence" (with chords at times) like the drumset or timbales (besides, Giovanni Hidalgo plays the "cascara" with one hand on his requinto and "tumbao" with the other hand on two other congas, exactly like a timbales player, pattern of course ideal to accompany a second percussionist)). (NB: two congas with the same size can be tuned differently stretching more or less the skin (besides, sets of 5 different congas doesn't exists on the market (maximum 4, and only for luxury models))). Raul accompanies Carlos Santana with a continuous success since almost its begining. This is my current favorite set, ideal for arpeggios in my opinion, close to a modern drum set of "Weckl" type (with a small floor tom to the left of the left leg). The bass (tumbas) are placed in the back and mediums in the front, with a tonal descent from left to the right, the highest conga being between the legs, as the snare drum in contemporary (or jazz) drumset. 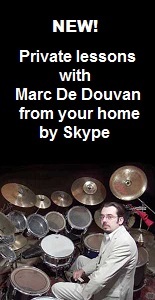 This set allows to optimize the method 2, widely used in jazz drumming, since their beginnings. 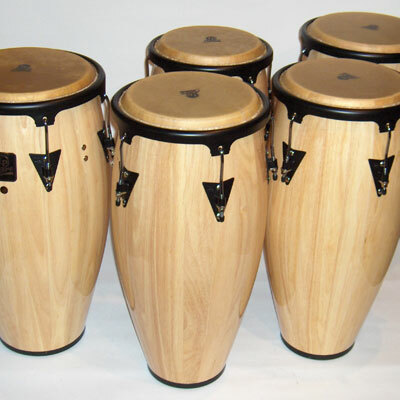 A four congas set only. To hear Ray use this set with such a variety of strokes and dynamics, you would swear to hear much more of them! Note the isolation of quinto (D) on the left, which only serves to "awaken" the attention at times (a bit like a "crash" cymbal) or extend arpeggios. A set of left-handed (just an example here: Giovanni changes often its configuration! ), almost like the previous one, but reversed. Giovanni plays often double notes with passage from one conga to another, in basic patterns with five congas that he has the secret. Giovanni often uses his requinto (E), to the right, as you would with a cowbell (which is why it is much tightened and sounds like a high bongo). His congas are aligned in front of the legs from the lowest to the highest (left to right), as timbales ("Latin" or classic ("timpani") besides). The bass are here in front and high on the sides, with a positionning that allows an arpeggiated descent with single stroke roll, from back to front (unusual in percussion). Anga passes alternately from a conga to another with the two hands with unusual speed and ease (beware of the muscles!). Also trumpeter and arranger, Jerry pass both hands from the conga (D) to requinto (E) for his solos with slaps in single stroke roll, giving the illusion of a dialogue between two congueros soloists, while passing at times on the other congas (masterful on the musical aspect!). Here are the highs to the left and lows to the right. There is obviously no restriction for the positionning of a conga set, as for that of a drum set. The sets presented here are only for example, learning, and culture. Note that the forming of a set can also be an object of creativity for a percussionist, unlike most of other instrumentalists, so take advantage of it!